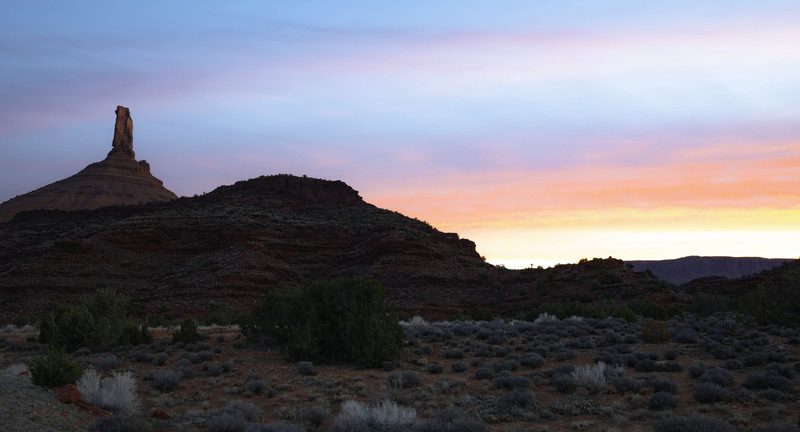 The canyon country that surrounds the town of Moab, in southeastern Utah, is the most beautiful place on earth. One could argue this in a variety of ways, but Edward Abbey’s assertion in his famed work Desert Solitaire, just says it best. One needs not to spend a lot of time in-and-around Moab to notice the sheer volume of outdoor enthusiasts that either visit or call this small town home. Mountain bikers, river runners, off-road enthusiasts, climbers, hikers, photographers, and others descend upon the town of roughly 5,000 full-time residents, each season to enjoy all there is this region of rock has to offer. The area is a mecca, of sorts, for outdoor enthusiasts from all over the globe due in large part to the neighboring national parks, BLM land, and wilderness designated spaces that exist here. The seemingly otherworldly rock formations of Arches and Canyonlands National Parks were certainly the draw for Backcountry Journeys guests who participated in the recently wrapped up inaugural Canyons of Utah: Arches & Canyonlands tour. 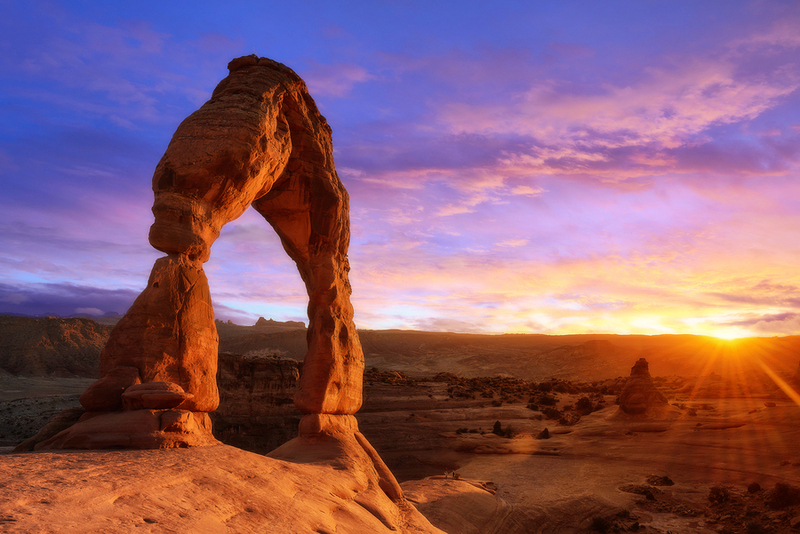 Geology is the highlight of any trip to Arches and Canyonlands National Parks. 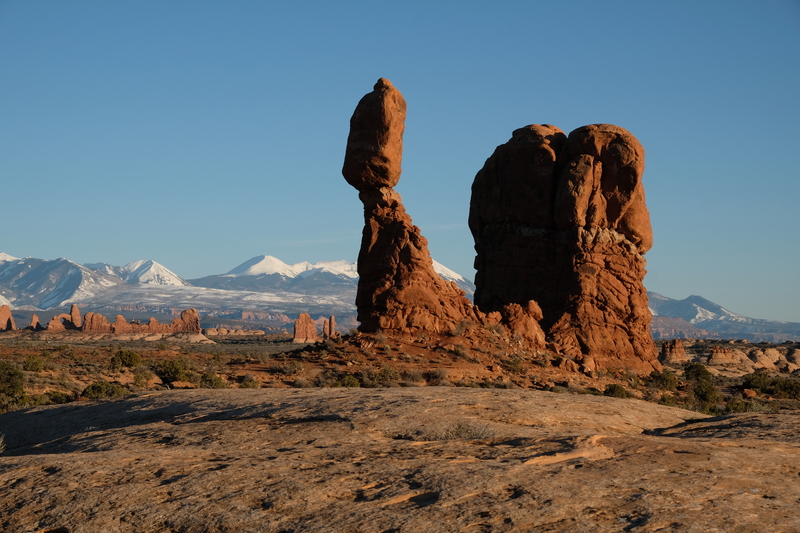 Rock features are the signature of these two parks, which are virtual neighbors located just outside of Moab. At Arches, the landscape is marked with sandstone fins, arches, balanced rocks and other eroded features that rise from dunes of rock that were at one time part of the largest sand desert on planet earth. 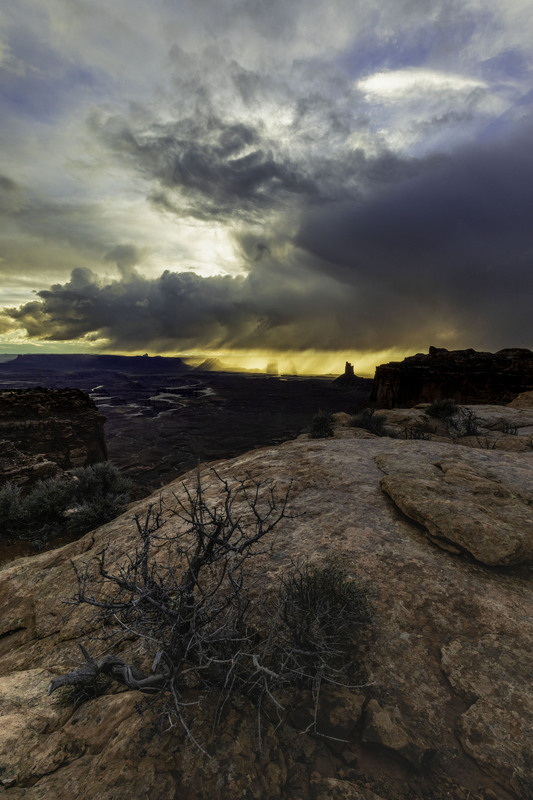 At Canyonlands, things are similar, yet different. The story of the landscape here is found in the eroded canyons, cut by the Colorado and Green Rivers, and other rock features that have been created by the power of nature and time. Both of these locations provided our little photography group with ample opportunity for landscape photography at its finest. The Homewood Suites located in the heart of downtown Moab would serve as home during our 5-day trip, and it would prove a strategic location so as to easily access the fine eateries of Moab. As is often the case on Backcountry Journeys trips, day one saw the trip kick-started with an orientation meeting and a delicious dinner. Miguel’s Baja Grill, a short walk from our hotel, made for a perfect location for our first meal together and would end up setting a high bar for subsequent restaurants to live up to. For those of you familiar with our Canyons of Utah: Zion & Bryce tour, Miguel’s may remind you a little of one of our favorites, Oscar’s Cafe in Springdale. The pleasant service and genuine Mexican cuisine at Miguel’s welcomed us to Moab nicely, and our itinerary and strategy for the trip were discussed along with any questions answered over burritos, tacos, and margaritas. Photo guide Chris Gheen, and I could tell right away that we not only had a friendly and funny group, but also a skilled group of photographers on board for this trip. We all knew what we wanted out of our photography for the week. Now it was time to go get it! The following morning would be the earliest wake-up call for us as the weather predictions for the week were indicating that this would be the best morning the for one of our featured targets for this tour; Mesa Arch. 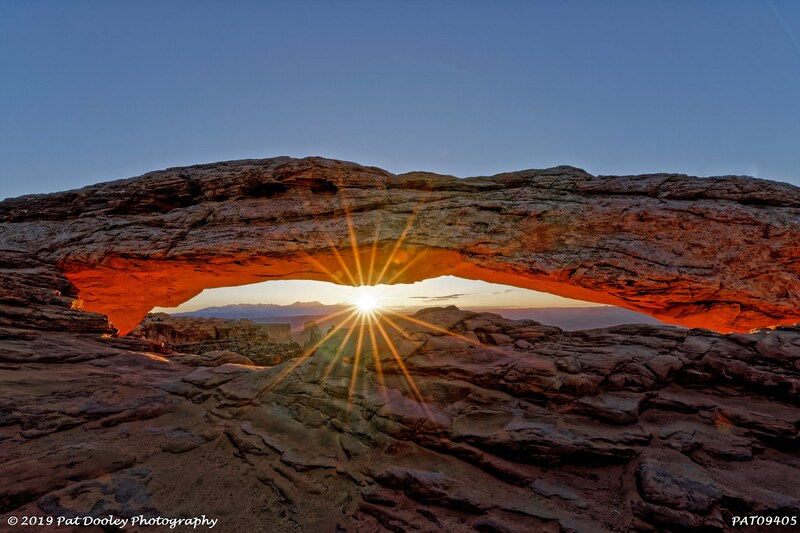 Mesa Arch is located at the Islands in the Sky District of Canyonlands National Park. Canyonlands is simply enormous, and is thus divided into ‘districts.’ Islands in the Sky, one of those districts, sits high up on sheer sandstone cliffs that are roughly 1,000 feet above the terrain below. 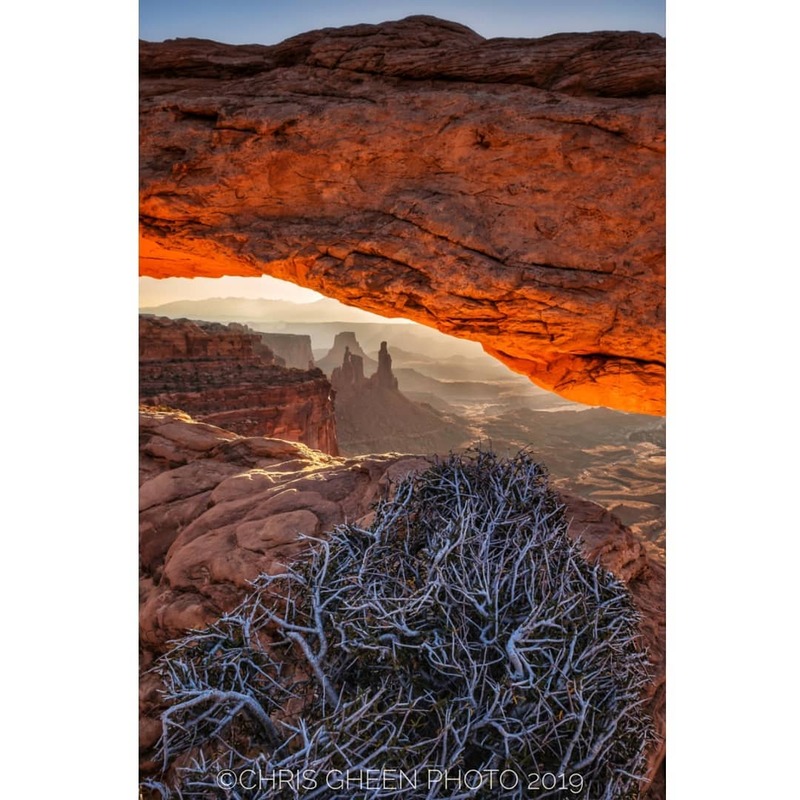 Mesa Arch is situated on the edge of one such cliff and is one of the more popular targets in this region for photographers. Rock spires below and the La Sal Mountains off on the horizon add amazing aspects to our compositions, complete with sun stars as the sun peaked out. The trail to Mesa Arch is relatively easy and short at only a half mile in length. Even so, we needed out 4 a.m. start in order to be the first ones to arrive, snagging precious and coveted spots to set up our tripods for the shot. We arrived a few hours prior to sunrise in a “hurry-up-and-wait” sort of strategy that every landscape photographer is certainly familiar with. 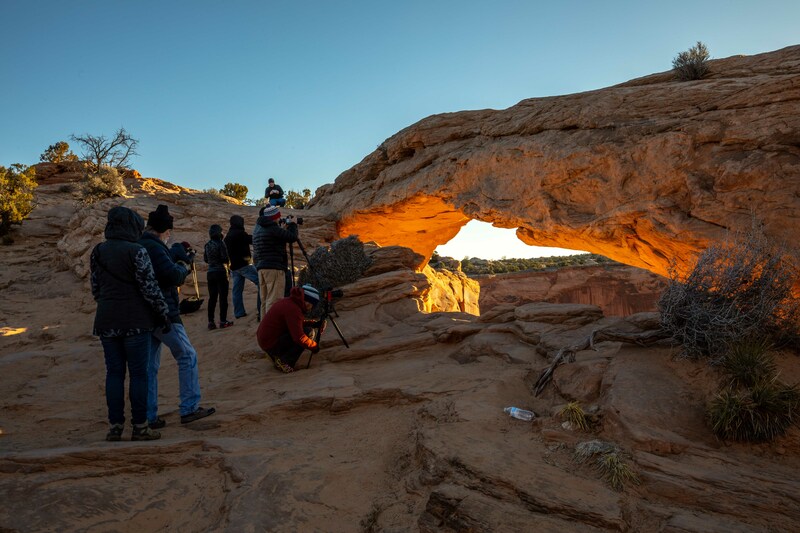 Sunrise is a ridiculously popular time of day at Mesa Arch, so arriving “just in time,” is far too late as you’ll more than certainly have a group of photographers, just like us, standing in exactly the spot you’d like to be. The sky on this morning ended up being perfect for our intended composition! As the sun rose above the horizon, Mesa Arch glowed from underneath, creating one of the more beautiful images from the trip. And we were only just getting started! After such an early start we decided to break following breakfast and reconvene for lunch before heading out again. Following lunch we set off for Arches National Park, stopping at the Visitor Center for a quick introduction to what we were heading off to see inside the park. We took a short hike at popular Park Avenue where we explored the geologic composition of the famous ‘fins’ and started to have a more in-depth conversation on the ‘hows’ and ‘whys’ of the region, geologically speaking. A quick stop at Skyline Arch precluded arriving at our sunset destination, Balanced Rock. 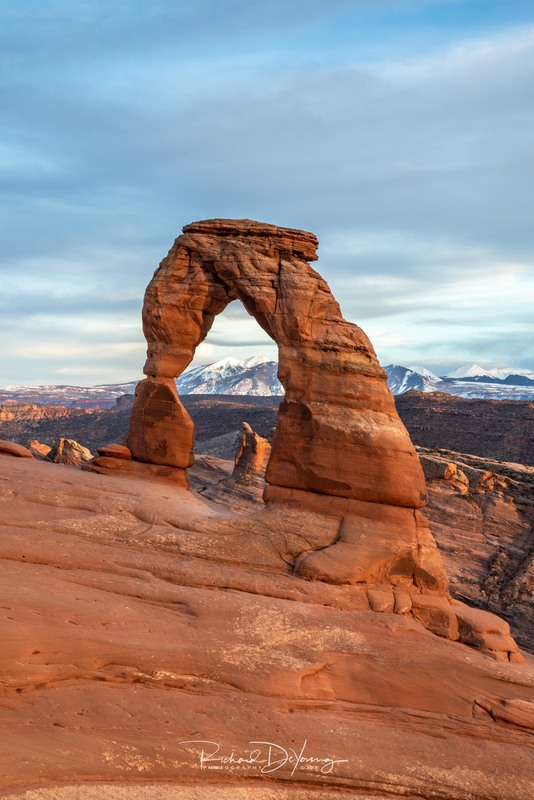 This is considered to be the most photographed rock feature at Arches National Park and offers a composition of the rock formation with the snow-covered La Sal Mountains off in the distance. 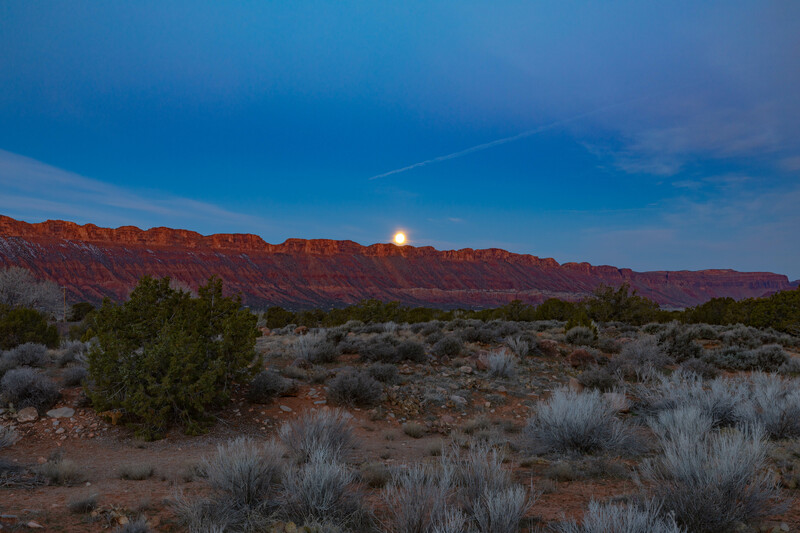 The La Sal Mountain range is the second highest mountain range in Utah with peaks rising upwards of 13,000 feet. The tallest being Mount Peale. “La Sal” dates to Spanish times when the “Salt Mountains” were a landmark on the Old Spanish Trail that ran between Santa Fe and Los Angeles. 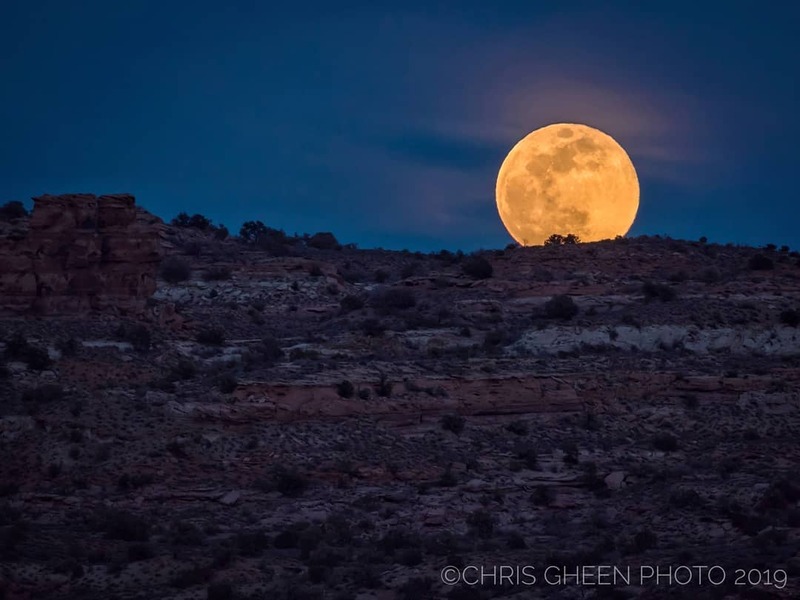 The range is roughly 20 miles south of the town of Moab and is a contrast of sorts to the red-rocked canyonlands that surround the island of green. The range is covered by pinyon and juniper trees down low, which then give way to oak and then to larger pines and aspen as one increases altitude. The highest timbered areas are covered with spruce and fir. One would be hard-pressed to find a more beautiful background for shots such as our Balanced Rock scene. The nearly full moon rose during our shoot, just a bit left of our compositions. Clouds on the western horizon dampened our hopes for alpenglow, but most if not all of the group was able to put together some nice images on our first evening. After losing light for the evening we traveled back to Moab and on to one of its more famous eateries. In fact, The Sunset Grill is the oldest operating restaurant in Moab. Anyone who has driven through Moab has likely seen this restaurant, sitting high above the town on a cliff band of rock offering stunning views from any of its four dining rooms and/or outdoor space. The building that houses the Sunset Grill was originally a home built in the 1950s by The Uranium King Charlie Steen. Steen was a geologist who had come to Moab in search of uranium. In July of 1952 Steen located ore that would put Moab on the map as far as uranium mining was concerned, making a personal fortune in the process. Newly rich, Charlie built a home, high up on the cliff with a “million dollar view,” that at one time housed the largest swimming pool in Utah. This home has now become the Sunset Grill, where we shared a delicious late dinner and nighttime views of the twinkling lights of Moab far below. Our second-morning shoot took us to Castle Valley for a look at the famous Castleton Rock. Castle Valley extends from the Colorado River towards the foothills of the La Sal Mountains roughly 15 miles to the northeast of Moab. The famous rock pinnacles here in addition to Castleton Tower are the Rectory, The Nuns, Priest, and Adobe Mesa. You’ve more than likely have seen this region in films and television such as HBO’s Westworld and Indiana Jones and the Last Crusade, among several others. Prior to the sun rising on our subject, the full moon rose across the top of Porcupine Ridge, providing a really nice scene while we waited for the (hopeful) main event. A thin strip of cloud perfectly in the way on the eastern horizon tapered the glow we were hoping for, but the thin clouds did turn a bit ‘easter egg’ pastel which made for nice images. We decided to take a short drive up the La Sal Loop Scenic Drive, and additionally along the Colorado river offered a few more chances for photographs prior to getting breakfast and coffee back at the hotel. This evening was to be our earliest start, so we decided to take lunch “off” and meet up for an extremely early dinner. A ‘linner,’ so-to-speak. The reason for such an early start was that a 1.5-mile hike over 500 ft. of elevation gain awaited us. We were off to Delicate Arch this evening, which tends to draw crowds at sunset, much the same as Mesa Arch does at sunrise. We needed to get there and get there early. Our group made easy work of the hike up the hill to the Upper viewpoint, the 1.5 miles and 500 feet of elevation gain cross-country travel following cairns over the slickrock didn’t get in the way of anyone’s quest for this image. Our work paid off, however, with some really nice light on the La Sals, which fill the horizon directly behind the arch. A large crowd was there to bear witness, even a bride and groom couldn’t help but hike up in their formal wear for some photos. The full moon rose behind our sunset scene, waiting like a gentle person until after the light show so that it could be the icing on the proverbial cake for those paying attention. Day four of our tour was going to be our worst weather day of the trip. Forecasts were for rain all day. We awoke early assuming that we might be chased off by rain, but wanted to give it a shot as the sky could be dramatic with impending weather. The Windows region at Arches is a series of three named arches, North Window, South Window, and Turret Arches, respectively. 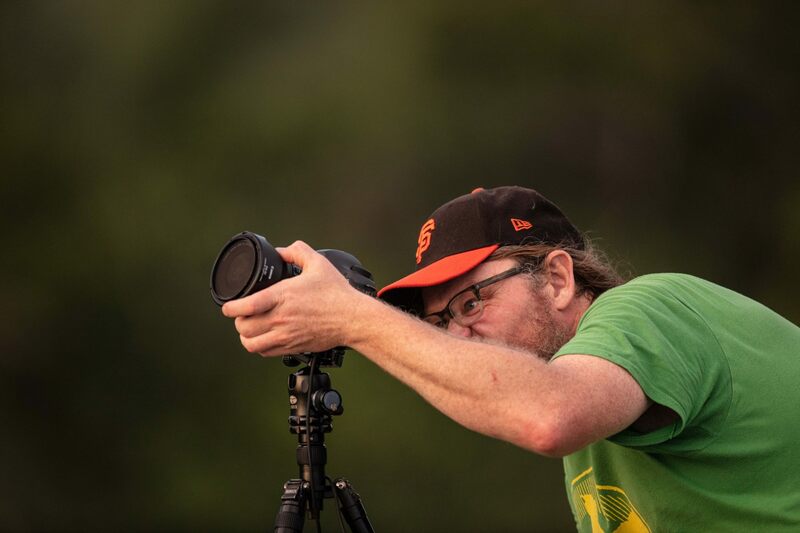 A “shouldn’t miss” location for sunrise photography. Dark and cloudy skies ruled on this morning so while our traditional sunrise shot of light glowing on the face of a rock formation may not have bared any fruit, we were able to use our imaginations to come up with some really nice compositions. There were certainly good clouds in the sky. Rain moved into the region for the good part of the day, which allowed us to take some time for a post-processing session. We broke out the laptops and projector and got to work taking a closer look at our compositions. This sort of work goes a long way towards our goals as photographers to achieve a more intentional approach to our images. A large picnic-style spread of sandwiches, fruit, chips, and cookies helped satiate our lunchtime appetites as we moved on to tips and tricks with Lightroom. Calling it a “microphone drop” might be the best description of this sunset. Just look at these images and try not to drool. 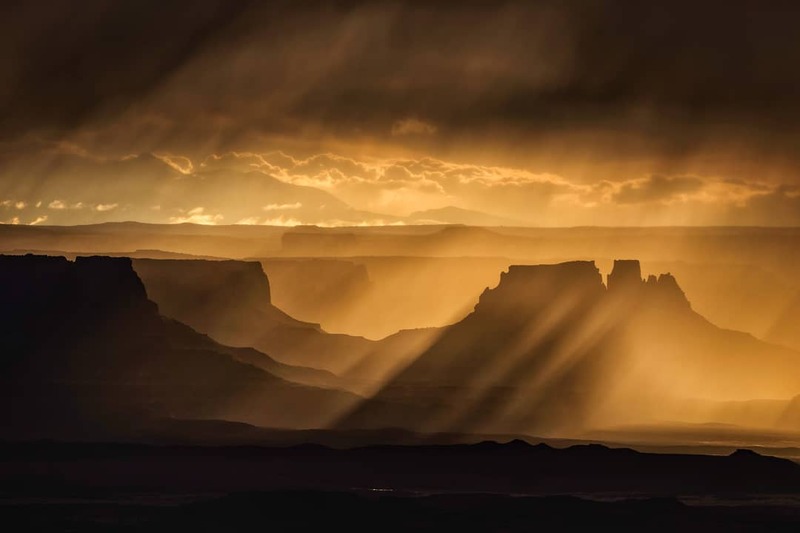 While driving up to Canyonlands ‘Islands in the Sky’ district on this particular evening we knew something special was brewing… The atmosphere in the region resembled monsoon season more than early spring, unusual for March. The skies were dotted with rain showers in pocket storms all across the horizon. While en route we crossed paths with an amazingly dense rainbow just in front of the La Sals. While driving we thought that we may have missed something special. As we pulled up to our intended sunset shot at “The Neck,” we were hoping that more was in store. The Neck has a wonderful perspective of the Shafer Trail that connects the rim to the White Rim trail located far below. The 100-mile White Rim Road loops around and below the Island in the Sky district, providing a challenging (typically) multi-day mountain bike trip, as well as expansive views. The White Rim trail is a HUGE draw for mountain bikers to Moab and is found in classic images of Canyonlands from this viewpoint. 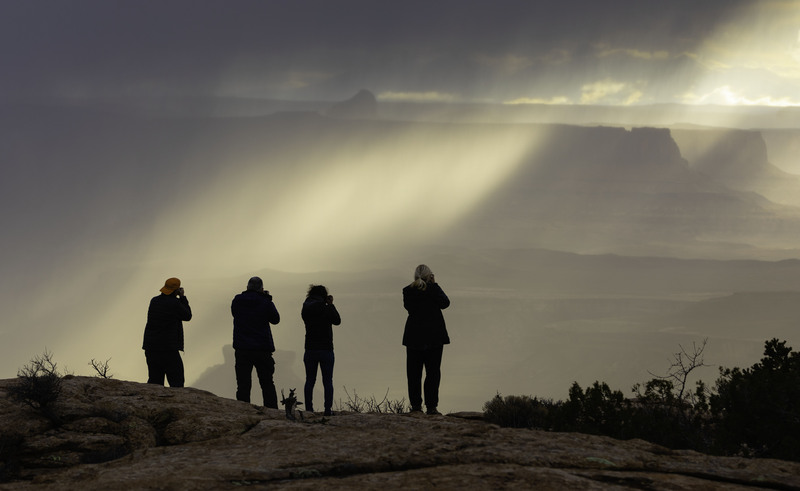 After shooting a bit, we abandoned our perch towards Grandview Point, hoping a rebirth of light would bless us with another chance at the Canyonlands below. We wouldn’t quite make it to Grandview, though, as one of the more special sunset events these eyes have ever witnessed was taking place off to the west. We shot this sunset facing the setting sun, and it was like going to church in a whole dang brand new church. It was hard not to believe in some sort of higher being while watching what we were blessed to have watched on this night. There is not much else to say about it other than there are not many descriptors in our language that can do it justice. Really. The images are just an “also-ran” to the moment we shared watching this unfold. Dinner and celebratory drinks took place at the La Sal House, which is located on the same corner block as our hotel. The La Sal House did not disappoint, proving to be the perfect dinner spot for a celebration. The good folks at La Sal House were more than welcoming towards us, even though we needed a reservation time after their normal cut-off hour for reservations. Whether it was the duck (which featured Aji Amarillo peach glaze, Anson Mills stone ground grits, apple pear mostarda, Brussels sprouts-and YES this is what YOU should order when you visit), the Steak Frites, or the Colorado Lamb, dinner was superb! As satisfying as our evening at Canyonlands was, we certainly weren’t done yet. We still had one more MAJOR shot. Landscape Arch, which is the longest of the roughly 2,000 natural rock arches located at Arches, served as our final location. 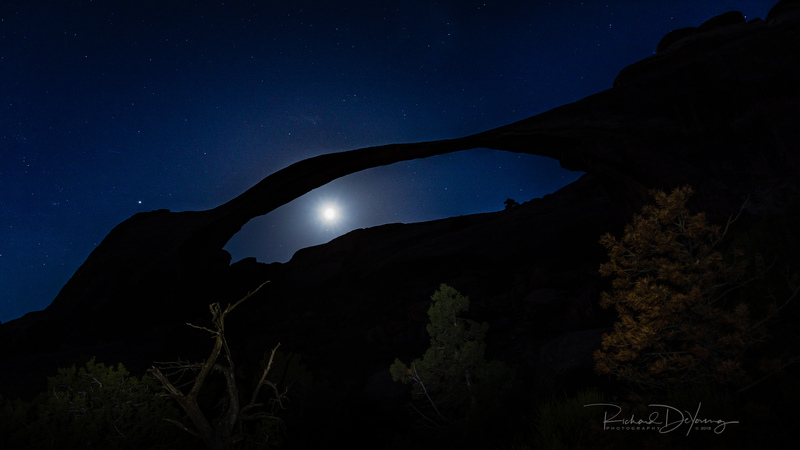 It is the fifth longest natural arch in the world with a span of 290 feet, with its light opening measuring 306 feet. 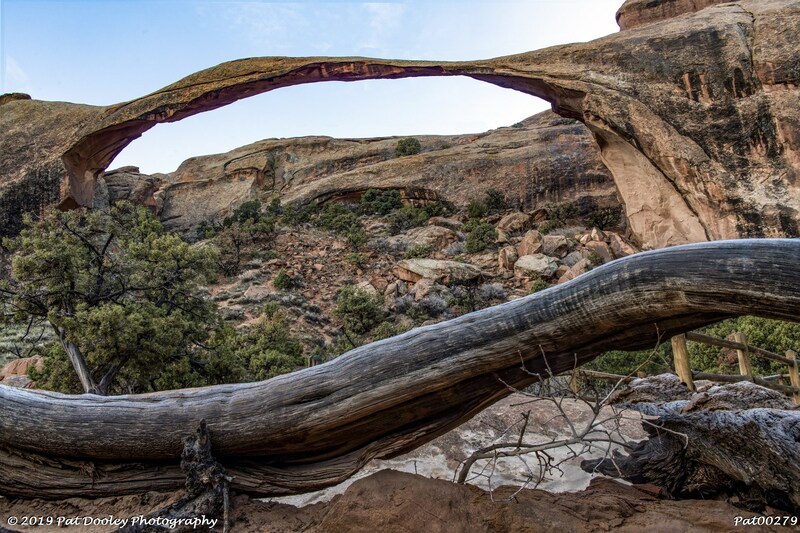 At its narrowest, Landscape Arch is a mere six feet in diameter. An entire American football field can fit inside of the width of this thing! And it feels as if it could fall at pretty much any moment. Our final meal together took place at the Garage, a delightful coffee shop with an extensive food menu, located on Main street in downtown Moab. Goodbyes are always difficult, and on this trip with so many fun and wonderful folks, it was no different. We certainly appreciated our time spent together at the most beautiful place on earth, and hope to see you all again, one day, on another Backcountry Journeys adventure!